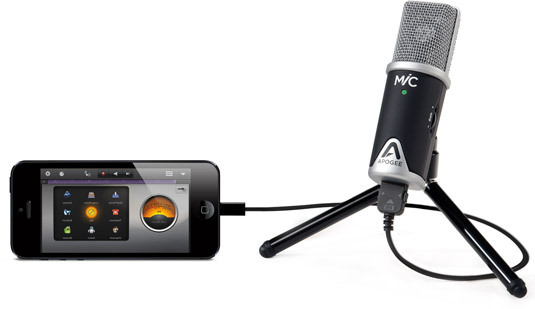 A dedicated iOS mic is a mic designed for the single purpose of connecting to your iPhone or iPad. It may look like a regular mic for most of the body, but the connection ­terminates in either a Lightning or a 30-pin connection designed to plug directly into the data port of your device. Depending on the amount of money you spend, the audio quality of these mics can vary greatly. Remember that the higher the bit and sample rate, the better quality of audio you’ll get during recording. Portability: If you need to record something out in the real world (which means away from home or the studio, so that sentence could mean a whole lot of things), all you’ll need is your iOS device and your mic. The mic gets power from your iPhone or iPad, and you can take it anywhere you need to go. This portability can be especially helpful if you’re carrying other gear or travelling a long distance and don’t want to carry a lot of extra weight with you. Operability: To borrow a commonly used phrase, these mics just work. Because they were designed to interface with a specific kind of device, you can be pretty sure that you’ll get a good connection and app compatibility from the start. There’s always a little comfort in eliminating the unexpected from your recording plans. Of course, you can only use your mic with your iOS device, because other interfaces won’t use the same connection. So operability is both a blessing and a curse. But you can’t have everything, can you? Simplicity: Just plug it in and go — that’s all you have to do. Because the mic only works with iOS devices, you don’t have to worry about any extra cables or boxes. You’re good to go, right out of the box. Only one mic: While dedicated iOS mics are amazingly portable and functional, they can also be quite jealous in that you can only use one at a time. Since you only have one data connection, you can only plug in one mic at a time. Which means you can only record from one place at a single time. Hopefully you’re the kind of person who finds a lack of options liberating, because you’ll only get one way to record audio. Battery life: Always remember to charge your device fully before recording with your iOS mic, because your device will power both your apps and your mic. And because the mic already uses a data connection, you can’t charge and record at the same time. Watch your battery meter and get to work — you’re wasting time and energy!